Likely the biggest release so far in 2018, Monster: Hunter World (rather appropriately) took the world by storm, revamping a beloved yet somewhat lethargic franchise and ushering it into a new era. Far more accessible than its almost elitist predecessors, MHW is the perfect entry point for curious bystanders who have been keen to finally take the plunge and set off slaughtering all hapless creatures foolish enough to cross their path. In this sense, the game’s wild success has helped to broaden its appeal even further, with a flourishing online community of players of all skill levels, perhaps just as frightened and incompetent as we are. This doesn’t come at the compromise of what made this franchise famous to begin with, however, and longtime veterans will rejoice in meeting up again with familiar old foes, as well as a swarth of hideous new beasts keen to make them their next meal. Whether you’re skilled enough to break free in these times of peril will dictate your survival, but not necessarily your enjoyment: sometimes, the discovery and shock of getting your rear completely kicked on the first attempt is equally as compelling as a successful hunt. MHW is an intelligently designed game, and though the selection of monsters is small compared to previous rosters, more are being progressively introduced into the ecosystem. 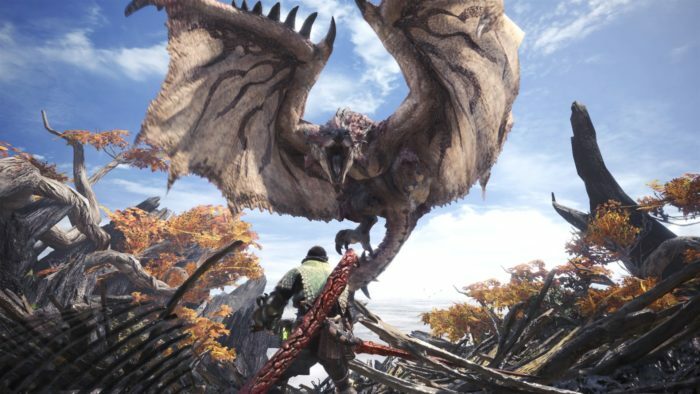 Fan favorite Deviljho recently made its return, and eager hunters leapt at the opportunity to mount that ugly sucker on their wall. Fingers crossed that the inflatable shark Zamtrios is soon to follow.